The ignition switch includes a device that helps prevent accidental removal of the key while driving. 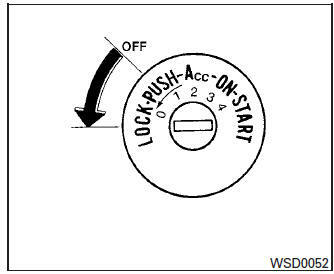 The key can only be removed when the ignition switch is in the LOCK position. In order for the steering wheel to be locked, it must be turned about 1/8 of a turn clockwise from the straight up position. To lock the steering wheel, place the ignition switch in the LOCK position. Remove the key. To unlock the steering wheel, insert the key and turn it gently while rotating the steering wheel slightly right and left.